A starter motor is used to rotate the engine over to begin the combustion process and is controlled by the ignition key, start button or fob. A flex plate or flywheel has gear lined with teeth around the outer ring called a ring gear and is bolted to the engine crankshaft which the starter uses to operate. The starter motor pulls the most amperage of any other component so the battery must be in good condition. When the engine will not crank (roll) over the problem can be isolated to three separate areas of the car. It could be the battery or a connection issue, the starter motor or its trigger circuit is not working and finally the engine or one of its accessories is locked up. Some problems will be easy to fix while others can be a little tougher. We describe all repairs in the following guide and will go over each in order of popularity. The starter motor processes high amperage which causes the brushes, bearings, solenoid and armature to wear out usually within five to seven years of usage. Auto-start vehicles (engine that shut off at a stop then start again when you press the accelerator) use the starter motor over 30 times more than conventional vehicles without this feature. These cars will experience a higher rate of starter failures. The cost on a starter not working can vary from no charge to many hundreds of dollars so it is important to get a clear idea of what's wrong. For example a loose battery cable costs nothing to tighten, just a wrench and some elbow grease. Labor times generally range between .7 to 3.5 hours depending on location (some manufacturers locate the starter under the intake manifold). Starter motor replacements (part) can cost between $140.00 and $260.00 (US). We recommend OEM (original equipment manufacturer) rebuilds. Stuck and Need to Get Going? Many times when electrical items fail it's because there is an open electrical connection. This means a sharp vibration can sometimes allow the connection to work again. While tapping the starter housing with a hammer have a helper hold the ignition key in the crank position or rapidly press the start button. This can sometimes shock the connection into working again and allow the starter to turn the engine over. Keep in mind this will only work one or two times, the starter needs to be replaced. Automatic transmission cars have a gear range sensor (neutral safety switch) that can go out in park, try moving the gear selector to the neutral position and try it again. On standard transmission cars check to see if the floor mat is not lodged under the clutch pedal not allowing it to be fully depressed. Gear selector not fully in park. Noises and observing the dash and headlights is everything when the starter is not working. When the key is turned to crank the engine do you hear nothing and the lights stay bright? If so look to see if the security light is flashing which tells us the security system must be disabled before the starter will work. The next step is to check the starter system fuses and relay which will be located in the fuse and relay panel under the hood. The location of these components will be listed under the lid of the panel, in your owner's manual or you can ask our mechanics for locations or directions. 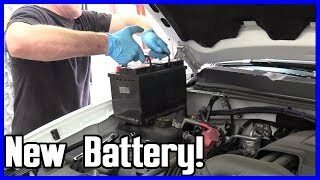 If the lights go dim or out this can mean one of two things (this can be accompanied by a ratcheting sound) either the battery is weak and needs to replaced which typical happens between 3 and 4 years or the battery cables are loose or need to be replaced. There can also be corrosion on the battery terminals inhibiting the current flow. While wearing rubber or vinyl disposable gloves grasp both negative and positive battery cable ends and try to wiggle them to check for tightness. If loose be careful not to touch the wrench or ratchet to any metal parts or the opposing terminal to avoid a short circuit. If the end is badly eaten away by acid you may need to use a pair of channel locks to work the cable end loose. Then replace the battery cable end which you can get from Amazon or the local parts store. The solenoid (big round thing attached to the starter motor) is responsible for the starter motor operation and must receive a voltage signal from the ignition switch. If everything before this point looks okay you need to test the solenoid trigger wire for power to determine the condition of the starter. The starter motor is usually underneath and on the right or left side at the rear of the engine block (can be under the intake manifold like on some Nissan, GM and Infiniti V8 engines. In this case it best to find the wire in the loom or at the relay). Lift your car safely using a hydraulic floor jack and secure the vehicle with jack stands to access the wire for testing. Locate the solenoid trigger wire which is the smaller of the two electrical connections. Connect a test light to ground and have a helper hold the key to the crank position. Touch the point of the test light on the terminal of the trigger wire, it should light up. If the test light does not illuminate there is something wrong with the starter wiring circuit which we can help with. Also test the large power terminal which is connected to the positive side of the battery it to should also have power (While testing, do not connect the test light probe to ground while checking for power at the starter). If both terminals have power the starter has failed and replacement is required. Sometimes you will hear the starter click but not activate. This is telling you the solenoid is working but the motor part is bad. Many abnormal noises can occur while the engine is not cranking over. These noises include grinding, whirring or a loud clunk indicating a possible mechanical failure of some kind. The starter is a high torque electric motor fitted with a small gear and a mechanism called a bendix. This small gear engages with the large gear called a ring gear on the flywheel (standard transmission) or flex plate (automatic transmission). The small gear contacts the large gear only when the starter is engaged and then retracts after the engine starts. The solenoid is an electromagnetic switch and lever that throws the small gear outward into the flywheel while turning the starter motor on. If the solenoid fails it will not push the bendix gear completely into the flywheel which then creates a grinding noise which means the bendix is not working correctly. Once the starter has been removed check the teeth of the flex plate or flywheel with a flashlight. If teeth are missing or badly worn the flywheel must be replaced before installing the new starter. If the starter makes a single "clunk" noise and then nothing it might be working just fine, the problem could be the engine is not allowing it to work due to a mechanical failure of some kind. To start troubleshooting this problem remove the serpentine belt and check to see if each of an accessory such as the water pump, alternator, air conditioner compressor and power steering pump spin freely and are not locked up. I locked up accessory can cause the starter motor not to work via the serpentine belt. If the engine will still not turn over check for internal mechanical failures which can stop the engine from rotating such as a spun rod or crankshaft bearing, broken piston or rod, dropped intake or exhaust valve or a blown head gasket. The easiest way to check this is to manually turn the engine over by hand by installing a socket with a breaker bar fitted to the front crankshaft bolt, try to move the engine clockwise. It should be a little difficult but not impossible to turn. If the engine is locked up it will need to be replaced or repaired. Please ask our mechanics we are happy to help, and its free.